The wife of French presidential candidate Francois Fillon was given preliminary charges Tuesday over well-paid parliamentary jobs. PARIS: The wife of French presidential candidate Francois Fillon was given preliminary charges Tuesday over well-paid parliamentary jobs that investigators suspect she never performed. Fillon himself had already been charged in the case, which has deeply damaged the conservative candidate's chances for the two-round election April 23 and May 7. He is suspected of misusing public funds, receiving money from the misuse of public funds, complicity in misusing public funds and improper declaration of assets, among other charges. 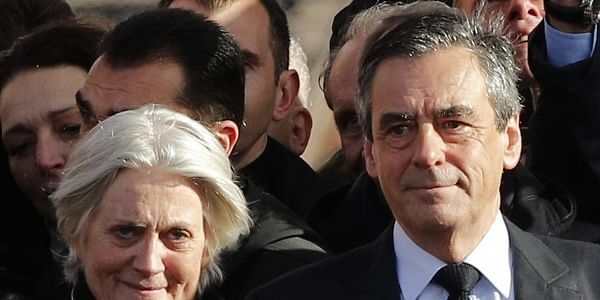 Investigating judges in Paris handed his low-profile Welsh wife, Penelope Fillon, preliminary charges on Tuesday. A justice official said she was charged with misuse of public funds, receiving money from a misuse of company assets and receiving money from a fraud. The official was not allowed to speak publicly about an ongoing investigation and requested anonymity. Financial prosecutors are investigating allegations that Fillon gave his wife and two of their children taxpayer-funded jobs as his parliamentary aides that were allegedly fictitious. His family members were paid more than 1 million euros ($1.1 million) over a number of years for the positions. Investigators recently expanded the probe on suspicion that the couple falsified documents to cover up evidence once the probe opened. They are also looking into a contract that allowed Penelope Fillon to earn 100,000 euros ($108,000) as a consultant for a literary magazine, La Revue des Deux Mondes. Media reports suggested that job also was a ruse, saying she wrote only two reviews in 2012-013. The Fillons have denied wrongdoing. Francois Fillon, once the election's front-runner, has called the investigation a smear campaign to torpedo his candidacy. He initially said that he would withdraw if charged, but then decided to remain in the race.